Once more, unto the beach dear friends! Colin Meloy and the crew have put together another stunning pop album with the same smirk inducing subject matter. Here we hear wonderful songs about disappointing sport players, revenge planning mariners, child kings, and that's only the tip of the iceberg. 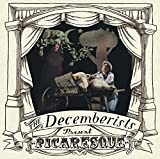 What really puts Picaresque above and beyond even the previous Decemberists records is that Colin Meloy's already stellar songwriting has been taking to the next level. Every hook is a bit catchier, every rhyme a bit sweeter, and every picaroon a bit more picaresque. I don't hesitate a bit when I tell you that this is the best album that will be released all year, and probably the best album of the decade thusfar.